I always seem to forget to keep my empty bottles that i have used up during the month. I am such a neat freak than i can't help but clear them away straight away but here are some of the bottles that i managed to save from the dump. This is the first time i have done one of these posts but they are some of my favourites to read on blogs and watch on youtube. I have repruchased these two makeup remover and toner for several years now. 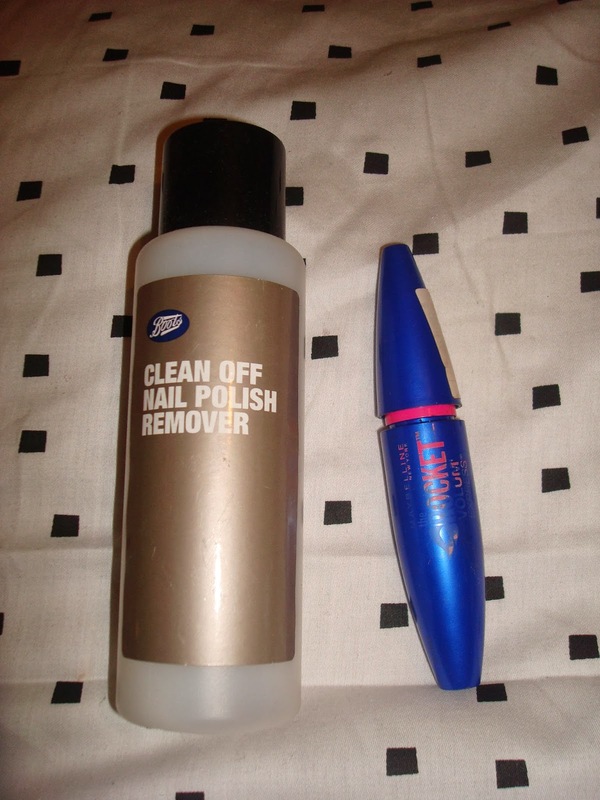 The makeup remover especially had got to be oe of the best products that i have actually used. 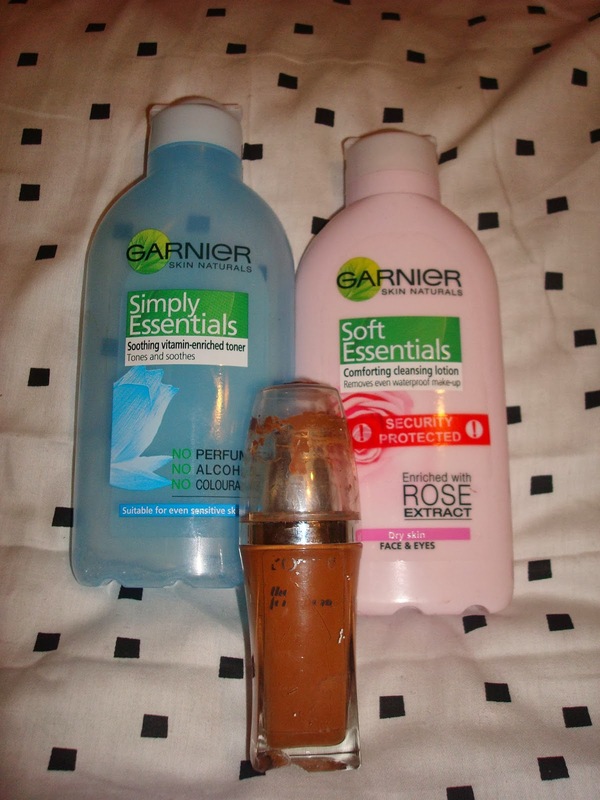 Thank you so much Garnier since you have saved me so much money and time over the past few years. The product is amazing and it does two things: it cleanses the skin and removes waterproof makeup at the same time in one easy way. And i have to say finally a cleanser that clean sensitive skin without drying it out, since it has no liquid paraffin in it.IIt can leave a slightly oily residue on skin, but i always wash it of with some warm water, so for me its not too much of an issue. At just three pounds a bottle i have to say if haven't already tried it then go out and get your hands on one. The toner was lovely as well, although i have to say idont really use it as much and only started using it when one of my friends recommended it to me. it was ok but just felt like it was water with some scent to it that i was putting on my face. I am not too sure if i will repurchase after this time. and the only reason why i repurchased in this case was partially due to the fact that i felt i didn't really notice what it did overly much on my skin and my friend had raved so much about it. I did a review on this foundation a while ago and i still stand by what i said then. By far the best drug store foundation on the market. Vaseline- I never buy anything else for my skin except for this, Soup and Glory and some body shop body butter but i have to say this is the best due to the price and how it makes my skin feel. It is so moisturising and it also smells lovely. I have repurchased numerous time and dont see myself ever stopping unless they discontinue this product in which case i will cry. Garnier- One of the antiperspirants that i use, although i have to say i doubt i will be buying this one since it did leave white marks on my clothes even though it advertises that it is anti-white marks free. Givenchy- I stole this perfume when it was half full from my sister and although i used if of, i am not sure i would ever spend money to repurchase it. It smelt alright but it wasn't my smell.I am a girl who loves her Miss dior, YSL Parisienne. and Chanel coco Mademoiselle. YSL- ohh i wish that one could smell through an on line blogpost. I love this, it and miss Dior cherie are simply amazing. Maybeline- I think this mascara is better than benefit they are real mascara and that is meant to be amazing. Not only is it a fraction of the price at just £8 but its blue as well.lol. the packaging it self is pretty though. I hope you have all enjoyed reading something that is a little bit different to what i normally write but i had fun. I'm a big coco butter fan! Cocoa butter is the one!